Dark Arts Books’ fourth title was released at the World Horror Convention in Toronto in 2008! Unusual, weird and wonderful, herein are twelve stories from the minds of four supremely talented — and twisted — authors. 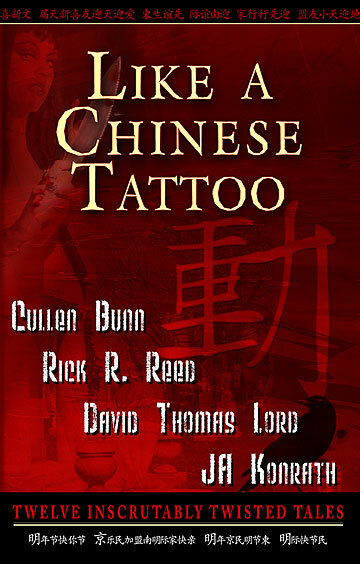 From the curse of the living dead to vengeance from beyond the grave, from the darkest corner of Africa to the bowels of the local cemetery, these tales are as unique and as mysterious as…well, a Chinese Tattoo! For fans of JA Konrath’s Jack Daniels mystery series, this collection includes a Harry McGlade novella, “The Necro Files.” (McGlade also appears in the Suckers novelette from Delirium Books, co-written with Dark Arts Books alum Jeff Strand). And those are just a few of the 12 offerings! Get A Free e-Book With Your Order! 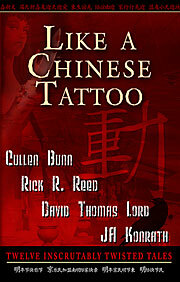 When you order a physical copy of Like A Chinese Tattoo, you can also get a free e-book version of the book. Click the Add To Cart button above and answer the question during the PayPal shopping cart checkout process and we’ll send the e-book version your way when we ship the paper copy! You can also buy the e-book edition from Amazon.com or Barnes & Noble.